American statesman; first President of the United States; commander-in-chief of the Continental Army. 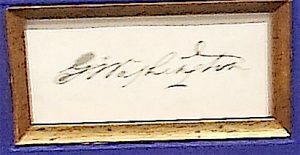 SIG – Vintage clipped signature from a document; slight bleeding and light but entirely legible. 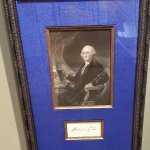 Professionally matted in Continental Blue moire fabric with a vintage (circa 1832) fine steel engraving of Washington; encased in museum conservation glass and high-end wood frame.